For the past two and a half weeks, The Astronomer and I have been frolicking and feasting around London and France with my mother in celebration of her 60th birthday. 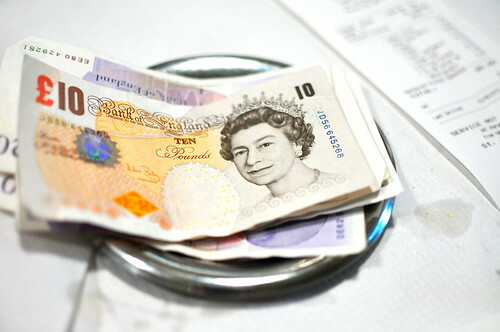 While our initial plans focused solely on France, airline prices dictated a jaunt through London first, and we were more than happy to oblige. Our visit, which was sandwiched in between the Queen’s Diamond Jubilee and the Olympic Games, was the very definition of short and sweet. London charmed us to pieces. 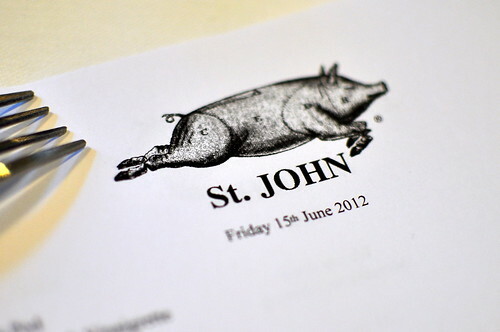 We headed to St. John, Chef Fergus Henderson‘s quintessential London eatery in Smithfield, for our first dinner in the city. 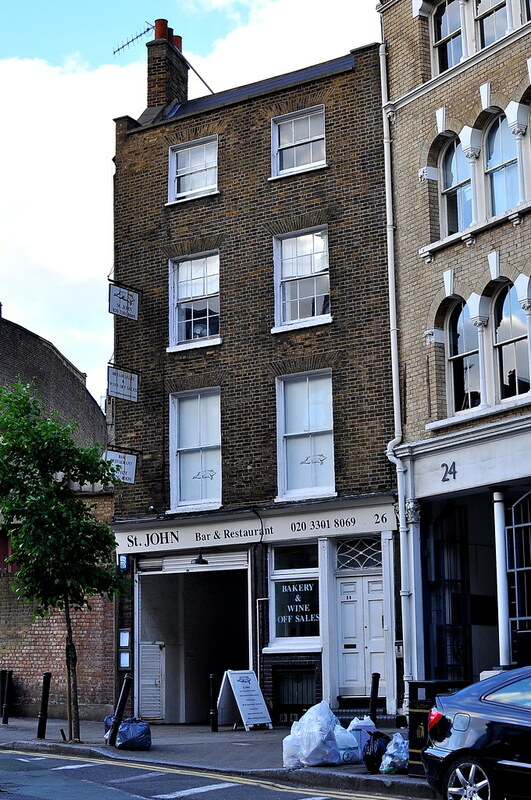 Opened in 1994, St. John specializes in traditional British cooking with an emphasis on “nose to tail” eating. Both the space and the plates here are sparse by design. 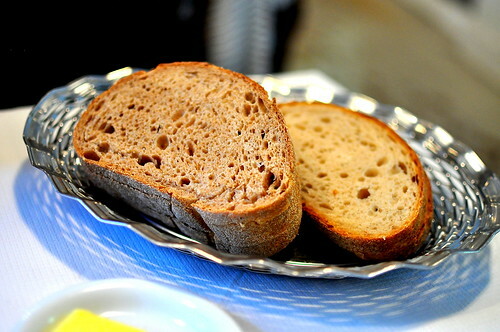 We were served slices of white and brown bread with perfectly softened butter just as soon as we were seated. The crust had integrity, while the innards were soft and wonderfully elastic. This was the first of many great loaves on our holiday. St. John is famous for its roast bone marrow served with a parsley and caper salad (£7.20), so we had to order one to start. The hot marrow was a cinch to extract from the bones using a special metal tool that I had never seen before. Though the calf’s marrow was too unctuous to consume straight up, it tasted damn near perfect spread on toasted bread and garnished with the greens and a pinch of coarse salt. 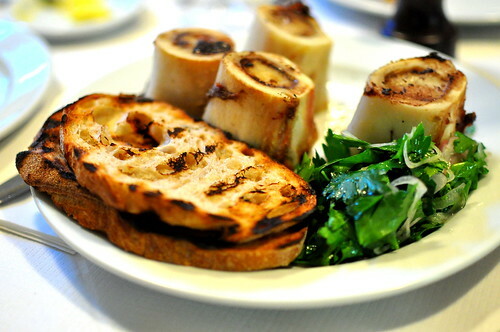 Bourdain was right: St. John’s roasted bone marrow is the stuff death row meals are made of. While our second appetizer, the rabbit offal and chicory (£7.20), didn’t bring on the fireworks like the roast bone marrow did, it was tasty enough as far as Mom and I were concerned. The livers didn’t come on too strong, while the hearts were snappy little nuggets. 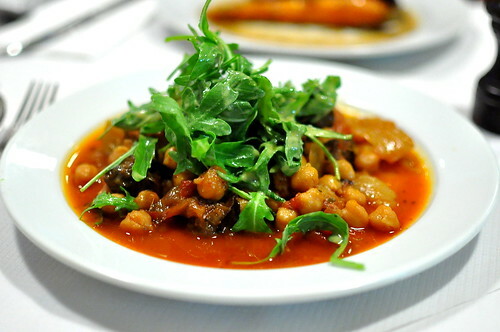 For her main course, my mother chose the “snail, sausage, and chickpeas” (£16.20). The flavors and ingredients in the dish transported our taste buds to Spain, which was an unexpected and wholly pleasant surprise. 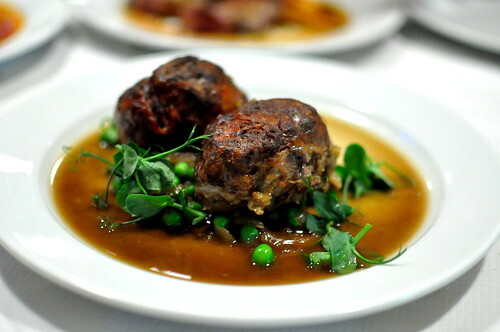 I chose the “faggots and peas” (£16.80) for my main course, plump meatballs comprised of hearts, kidneys, and livers wrapped in caul fat. Tonight’s version was made of pork. Whereas traditional meatballs are uniformly flavored and textured from top to bottom, every bite was a little different with these faggots. 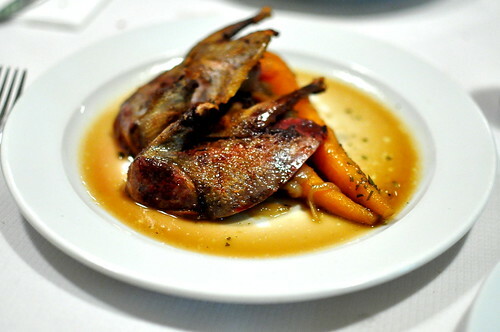 The lone disappointment of the evening was The Astronomer’s “pigeon and carrots” (£17). While the latter were cooked just right, the former had a chewy consistency that we couldn’t warm up to. From the sides section of the menu, the welsh rarebit (£5.20) caught my eye. 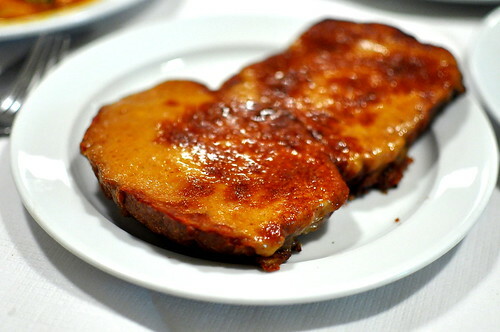 St. John’s version of this classic British dish is made from a hot and heady mixture of bold cheddar, mustard powder, cayenne pepper, Guinness, and Worcestershire sauce, melted onto a large slice of bread. It was a rich and unbelievably savory creation. 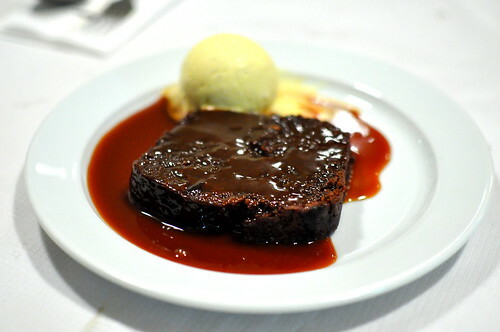 To finish, a dark and spicy ginger loaf served hot with a butterscotch sauce and vanilla ice cream (£7.20). This dessert was absolutely perfect. The cake was incredibly moist with intense gingery notes. I was expecting the butterscotch to be straightforward and sweet, but was taken aback by its complexity; its flavor was teetering on the awesomely fine line between caramelized and burnt. To set it all off: a scoop of rich, thick, and velvety vanilla ice cream. After eleven hours of sitting and sleeping in cramped seats, a meal at St. John was just the thing to fill our bellies and lift our spirits. Color me jealous: There are very few “destination” restaurants on my culinary bucket list, but St. John is definitely one of them. Everything looks jaw-dropping (and mouth-filling). ooh how exciting! I once was lucky to be able to sample a meal by Fergus when he visited SF at Incanto… I have some metal utensils that look very similar to the marrow prod, that I bought for the purpose of digging out prime nuggets from crab legs. Looks like a very fine time, glad to finally see what rarebit looks like, I always pictured rabbit! I want all the offal and bone marrow! So glad you are back and reading all the delicious adventures. Can’t wait to read you next post. So glad you enjoyed St. John! I’m not sure if we went on an off day, but the welsh rarebit was the only think I really liked. Boo for us. I’m still so jealous of your trip 🙂 Looking forward to reading about all of your experiences! I was there a couple months ago and had the delicious bone marrow. 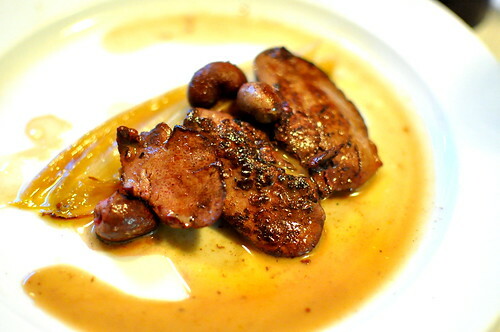 I look forward to going back and trying some other offal! looks sooo good. i’ve been dreaming about going to st. john for quite a while now. It’s odd that the pigeon (squab?) may have been the most ‘common’ thing ordered but just wasn’t executed too well. You guys really tried a good variety of different things! WOWZERS! I just kept going back to look at the photo of the roast bone marrow. I need to go to sleep right now but I can’t stop thinking about it. Bummer about the pigeon but everything else sounded like a delight.